The last two strings both have three notes per string in the first position. The 5th string, or A-string (played open, the note on this string is an A), has A, B and C. A is played without any fingers (or open), the B is played with the second finger on the second fret and the C is played with the third finger on the third fret. Notice the notes on the staff go below the bottom line. It can get tricky reading these lower lines and keeping them straight, but with practice, you'll learn them. The 6th string is the lowest string on the guitar. When played open, it plays a low E, which is the lowest note on the guitar. 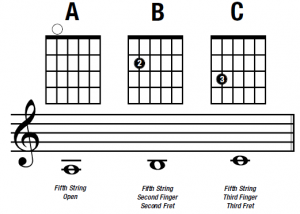 The other two notes are the F, played with the first finger on the first fret, and the G, played with the third finger on the third fret. This string is commonly called the 'Low E String' because if you recall the notes on the first string (also the E string), the notes and the finger placements are the same. Both are E strings and they basically mirror each other, except one is much lower! 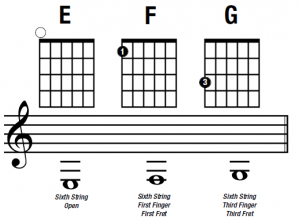 The best thing you can do in this session before moving on is to memorize all the notes on each string and be able to play through them without hesitation. 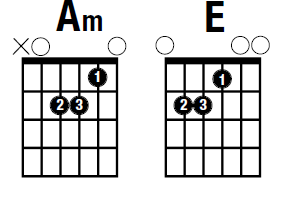 The circles above the chord chart means that string is played open. The X means you don't play that string. The chart corresponds with the fret board. Low E string is on the left and high E on the right. The solid circles with the numbers represent where your fingers are to be placed. For example, on the Am, your first finger goes on the second string, first fret. Your third finger goes on the third string, second fret. And your second finger goes on the fourth string, second fret. Practice these chords each time you are practicing your 5th and 6th string notes and you'll be ready for Session 5 in a couple of weeks!